Winco AXST-7, 7.5-Quart 14" x 2-3/4" Aluminum Professional Saute Pan, Heavy-Duty Commercial Grade Frying Pan is definitely an essential item for every kitchen and each chef. Made from heavy weight 3003 aluminum, this saute pan guarantees even heat distribution for thorough cooking. 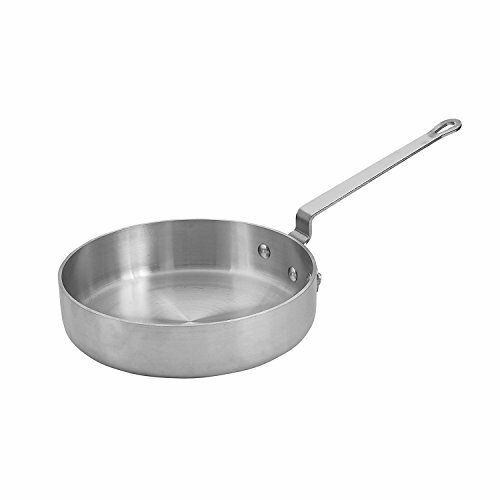 Thanks to its reinforced rim and bottom, this pan will withstand heavy duty use without warping. The long 10.8-inch temperature-resistant offset handle guarantees protection for you hand. An indispensable tool for home and commercial kitchens, the Winco AXST-7 Professional Saute Pan 7.5 Qt. is perfect for sauteing, frying, and searing. This professional sturdy saute pan is definitely an essential item for every kitchen and each chef. Due to its 3003 super aluminum construction with reinforced rim, this commercial grade fry pan is extremely durable and provides a great temperature circulation and heat distribution. The wide flat bottom and low vertical sides of this versatile frying pan provide an excellent thermal conductivity and quick evaporation, making it a perfect option for browning and stir-frying. The long 10.8-inch temperature-resistant offset handle guarantees protection for you hand and secure grip. An indispensable tool for home and commercial kitchen, the Winco AXST-7 Professional Saute Pan is a perfect choice for sauteing, frying, and searing.